This collection of tunes by Fiddlin’ Arthur Smith, call no. FL-0024, from the Southern Folklife Collection Song Folios, circa 1882-1983 (#30006), includes a number of fantastic Smith compositions that have become standards in the Country music canon. The folio features one of Smith’s most famous compositions, “Beautiful Brown Eyes,” a song he wrote in 1937 and subsequently won a copyright judgement against other artists that had recorded it, assuming it was in the public domain. 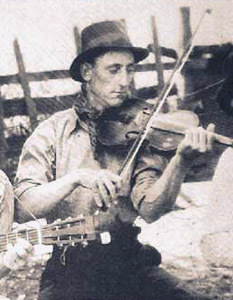 Fiddlin’ Arthur Smith and the Delmore Brothers recorded Adieu False Heart on January 26, 1938 in Charleston. Readers of The Celestial Monochord will recognize Adieu False Heart, of course, as one of the few pre-War hillbilly recordings about astronomy and cosmology. I’ve always thought the last line of the third verse should be “It’s every night it changes.” After all, the moon’s phases change from night to night — from month to month, they’re pretty much the same. But that third verse is great. For one thing, its astronomical imagery sets up the final verse’s mention of a fairly technical idea in cosmology — the speed of time. Coming after the previous verse, it gives a touching sense of the singer caught up in nature’s relentless, remorseless clockwork — he’s as much a victim of Isaac Newton’s conception of time as of a lousy girlfriend. That theme is emphasized by the recording’s pace, which is set by a firm, metronome-like guitar. As Arthur Smith sings the very last line (“Just as fast as time can take me”), the clockwork rhythm … gradually … slows … to a … halt. I’ve mentioned before, in the context of Tom Waits and Stephen Foster, that people who are grieving often become morbidly fixated on nature’s small details. Think also of Walt Whitman’s When Lilacs Last In the Dooryard Bloom’d. In a sense, Adieu False Heart gives us yet another person in deep emotional pain who becomes acutely aware of the natural world — and in this case, the “nature” that the mourner struggles to come to grips with is the very character of space-time itself. Most songs go to the four chord and then the five chord and quickly back to home base. This construction is quite rare and makes for an unusually beautiful ballad. You can find the song on the “lost” fourth volume of Harry Smith’s “Anthology of American Folk Music,” released on Revenant in 2000 for the first time. For one whose heart’s more truer.